1. 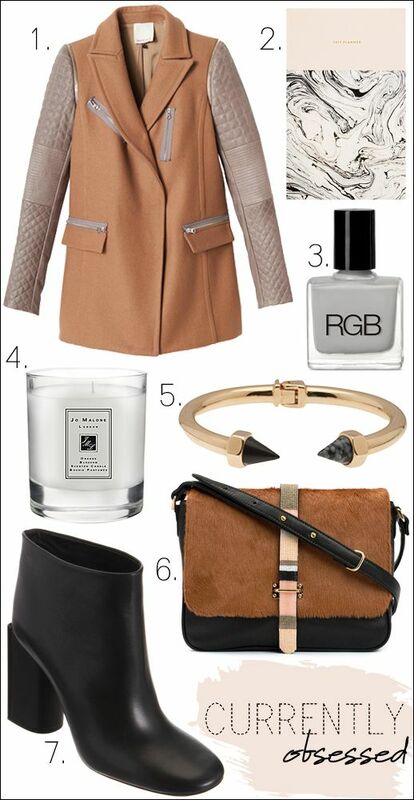 Rebecca Taylor Leather Sleeve Coat (more sizes here + here) - That color combo! 2. Julia Kostreva 2014 Planner - Just ordered. Obsessed with the marble print. 3. RGB Nail Polish in Dove - I've been on the hunt for the perfect light grey polish. 4. Jo Malone 'Orange Blossom' Scented Home Candle - This scent is so refreshing. 5. Vita Fede 'Luciano Cono' Bracelet - A beautiful sleek statement bracelet. 6. Lizzie Fortunato 'The Ninth' Bag - One of my many favorites from LF. 7. Rochas Laquered Heel Ankle Boot - Love the clean, minimal design of these boots. 0 Response to "CURRENTLY OBSESSED | NO. 1 | NEUTRALS + BLACKS"